If you’re thinking about reloading your own cartridges and aren’t sure where to begin, a great place to start is with the best reloading press for your needs. If you’re a beginner, no worries! We did a lot of research and put together this reloading press review to help you find the right one for you. Before we get started, let’s take a look at some of the features you need to know about to find the right one for you. 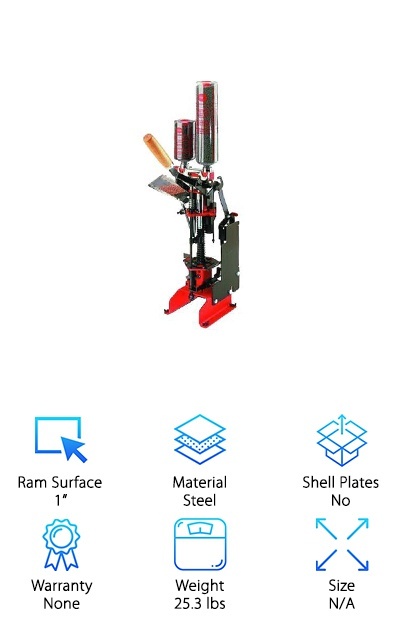 Ram Surface: The ram is the part of the press that holds the shells. So, the size of the ram should be compatible with the size of your ammo. On our picks, this measurement runs between 1 and 1 ?”. Material: These presses are tough and have to be able to create a lot of force. The materials vary slightly, but they’re all really strong metals. You’ll find presses made of cast aluminum, steel, and cast iron. Shell Plates: You need shell plates to make different sized ammo. Some of these presses come with one, but none of them come with extra ones. If you want to be able to make more variety, you need to add to it. Warranty: The warranties on our top picks range anywhere from 1 year to a lifetime. Think about it. Some of these presses are made with materials that last forever. As always with a warranty, make sure you know what’s covered. Weight: The weight on these varies a lot, too, but it really depends on the material and design. A single stage press made out of aluminum doesn’t weight much. A cast iron progressive press weighs a lot. Size: Keep size in mind because you need to have enough room to mount the press. Generally, single stage presses take up less room than progressive presses. It really all depends on what kind of press you’re looking for. 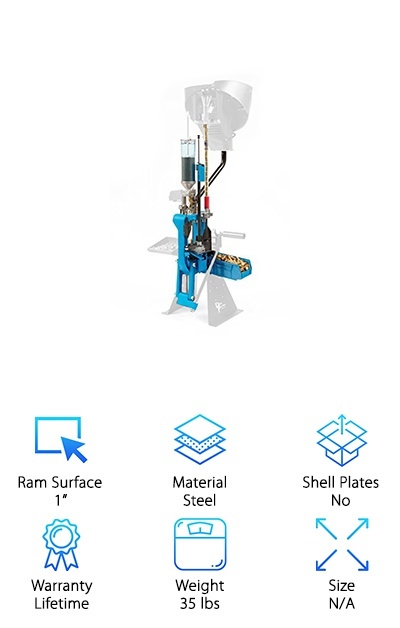 Now that you know more about how to find the best reloading press for you, let’s move right into our reviews. One note, we didn’t cover a fully automatic reloading press in these reviews. We stuck to manual ones. If you’re short on time, check out our top and budget picks first. They’re the first 2 list items. Stick around if you can to learn more about the rest of the awesome products we found. Ok, let’s get to it! Our pick for best progressive reloading press is this one from Hornady. Why do we like it? You can quickly switch dies so you can start loading other calibers. In fact, it was specifically designed to be user-friendly. That’s not all. It also has a 5-station bushing system. In less than 5 minutes, you can change from a 223 to a 45. One of the things we liked the most about it was really convenient, too. It has an EZject system that ejects cartridges easily without any extra adjustments. There’s also a built-in priming system and a case-activated powder drop so your job will go a little faster. The large-capacity hopper helps make things run smoother, too. If you want to get into reloading but don’t want to blow your budget, this is our pick for best reloading press for the money. While it definitely has a lot of value, it’s packed with some nice feature, too. For starters, the lever is balanced so that it won’t drop down on its own. That makes it pretty safe to use. The lock has a quick change feature and the C-frame design gives you a lot of hand clearance. And get this: it boasts the largest opening in the industry and the longest stroke, which means more work with less effort. To make sure it lasts a long time, it has a baked powder coating. It’s bright red so it makes this one look pretty impressive, too. 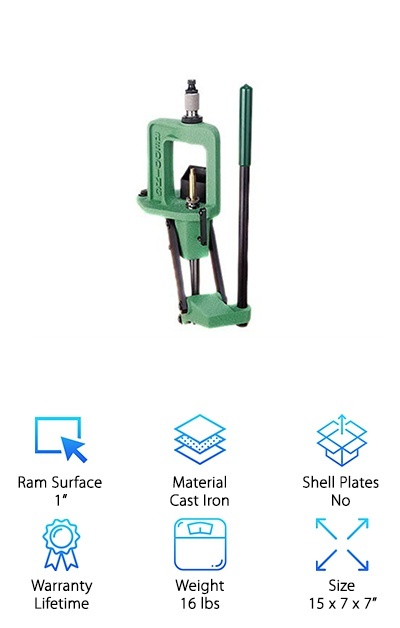 We’re calling this one from RCBS our best single stage reloading press and it’s a great choice for a beginner or a pro. Why? It’s made of high-quality materials, including a solid steel handle. It’s specifically designed for heavy-duty reloading which is why it’s been lengthened to accommodate the largest modern cartridge designs. It’s easy to understand and operate in part because it includes an ambidextrous handle. And get this: you can even upgrade it with the right piggyback. That’s another reason why this one is great for a beginner. It’s such a good feeling to know that you can use this same machine to do even more if you end up falling in love with the skill. One more thing: it has a lifetime warranty if used as a home reloader. 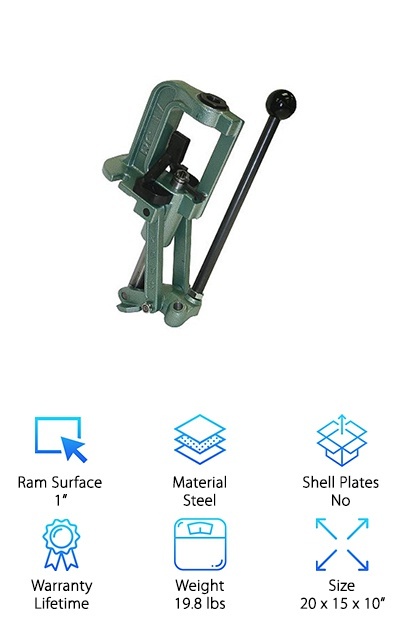 If you’re looking for the best turret reloading press, look no further. We found it. 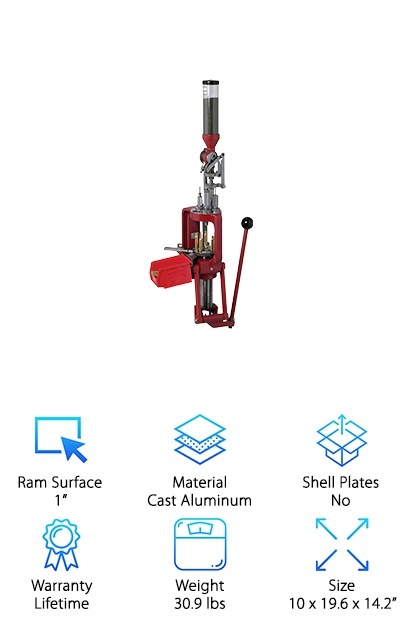 The Redding Reloading Press is powerful, fast, and convenient. The cast iron construction is a feature that’s been proven over time to be very effective and extremely durable. This one features a rigid 7 station turret so you don’t have to change out dies the way you would with a single stage press. Another cool thing about this one is it has a built-in priming tool but also leaves you the option to prime manually on the press. The turret moves very smoothly and the heads are interchangeable. That makes this a really versatile tool! It’s strong and has a lot of power behind it so it gets the job done easily, too. 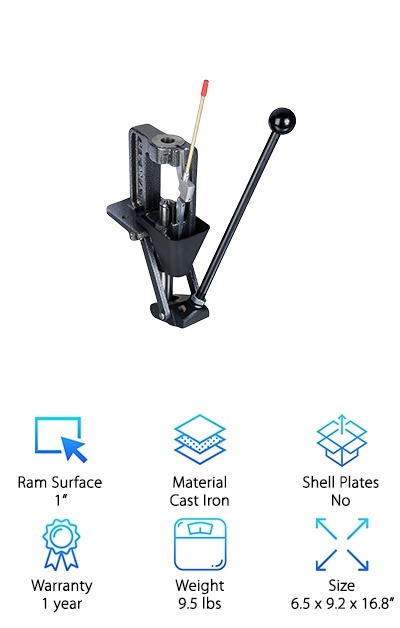 This Dillon Reloading Press is made to reload common rifle and handgun cartridges. Its state of the art technology works so well, it can produce up to 800 rounds an hour. That’s not all. If you need to change calibers, just use the quick change kit and you can swap the machine over in less than 10 minutes. One of the things that really surprised us was how easy this reloader was to operate because all of the steps to reloading are all done with one simple pull on the handle. You don’t even have to worry about adjustments because this one is designed so you won’t need to make any. Dillon has an amazing warranty. It’s simple. If it breaks, the will fix it for as long as you own it. That’s a pretty sweet deal. 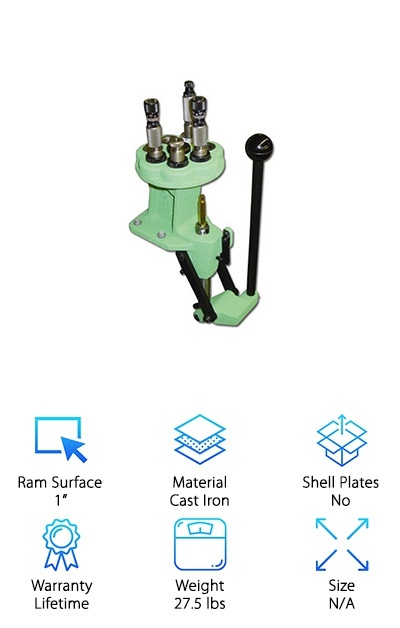 This strong press from SmartReloader is made of heavy steel. It’s designed to meet the needs of any reloader, whether you’re a seasoned pro or you’re just getting started. The special Instant Dies Release (I.D.R.) system is really special. It speeds up your work significantly because it lets you change the dies fast. How fast? Try 1.5 seconds. Plus, you only have to adjust the die once after you get it positioned correctly in the I.D.R. bushing. There’s more. It’s designed to be ambidextrous so it really can be used comfortably by everyone. Not only that but it also comes with 2 different primer arms, large and small. It also comes with a spent primer collection tube so you can keep everything neat until it’s time to dispose of it. This best reloading press for accuracy is from Lee Precision. It’s based on their classic design with one major addition. They added a quick-change die bushing. What does that mean for you? Quick die changing with only ? of a turn. Not only that but you’ll never have to worry about re-adjusting your die thanks to the breech lock bushings. The classic shape of this press gives you a lot of room to maneuver around without having to worry about any small or tight spaces. Plus, it has a primer hose fitting so you can collect everything without making a mess and aim it right into a garbage can. 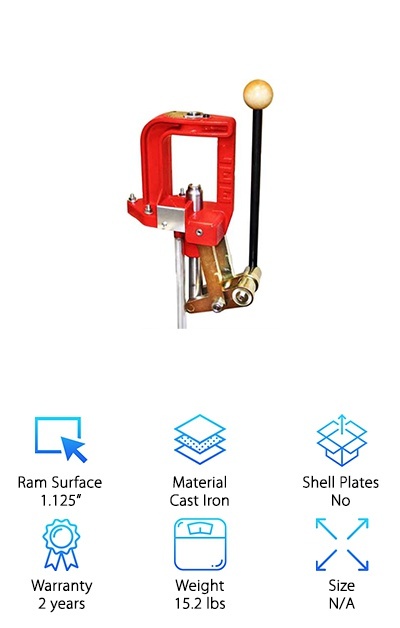 The baked powder coated finish not only make this a really durable press but the bright red color makes it really attractive, too. The Lyman Crusher Press has a lot to love about it. For starters, the base is machined flat so it’s easy to mount on a workbench. The frame is made of cast iron and powder coated with a silver finished that gives the illusion of hammered metal. It has a large frame opening so there’s a lot of room for you to work in and it’s made for either left or right-handed users. Why? Because the ball handle can be mounted for left or right-handed use. It can handle even the largest pistol cartridges pretty easily and is also perfectly suited for rifle ammo, too. 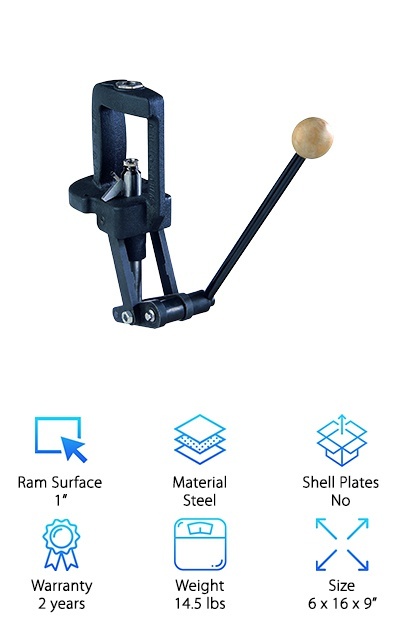 Overall, this is a very durable and strong press that won’t let you down. Plus, it comes with a 1-year warranty. The reloader from Mayville Engineering is fast and is a high-volume producer. How does it work so fast? For starters, the Auto-Dex technology automatically moves the shells through all of the reloading stages. And, get this, completed shells are automatically ejected after the final step. This means you don’t have to do it yourself and makes reloading even easier. It actually combines 10 different operations into only 6 stations, streamlining the process and making the whole process efficient and productive. 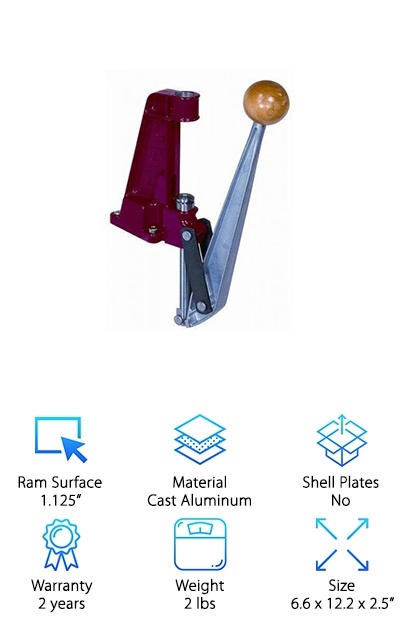 It makes a finished shell with each crank of the handle. You don’t even have to worry about any adjustments because their “Power Ring” resizer keeps everything consistent. Mayville Engineering makes high-quality equipment that will last and this machine is no different. This press is called “The Boss” for a reason. It’s made of strong cast iron that is designed to last a lifetime. The frame has a large opening that makes it easy to work with even with some of today’s larger and popular magnum cartridges. It also gives you clear visibility of your work area. This press is really easy to use which makes it a great choice for a beginner to learn on. The primer arm moves into position on its own as the ram moves. To make using it as comfortable as possible, they’re offset the handle. This also helps with access and visibility. If you want to mount it, you’ll find that the 3 mounting holes will come in really handy. Plus, it comes with a lifetime warranty.